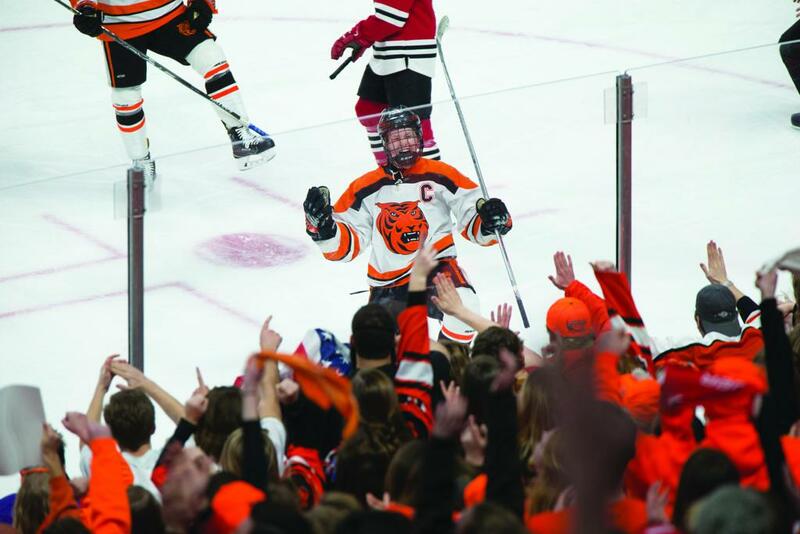 Minnesota high school hockey inspires. Please don’t take it for granted. In most places, youth hockey participation is directly influenced by the fortunes of the local NHL team. In some places, the college team can have an impact on hockey participation (did you know Huntsville, Alabama has close to 700 youth hockey players?). But nowhere has an annual “sign your kid up for hockey” magnet like high school hockey in Minnesota. How many 6-year-olds in Stillwater have attempted the Noah Cates spin-o-rama in their driveway? What message did Natalie Snodgrass send to young Minnesotans when she demanded to play in her Eastview High School game less than 24 hours after winning the 2016 U-18 World Championship? High school hockey inspires young Minnesotans. It’s not like this anywhere else. Minnesota has more 17-year-olds that still see themselves as serious hockey players. The belief that top players have to play only with and against the absolute best is widespread elsewhere. Many states create early hockey finish lines by putting their best 13- and 14-year olds on just a handful of club teams, sending a misguided message to other kids that hockey is not in their future. In Minnesota young players are spread out over 100-plus teams throughout youth hockey and this continues into high school. The vast majority of hockey players in Minnesota aren’t faced with their hockey mortality until they are 18. This is Minnesota’s special sauce: just keep playing. Hockey tales from Massachusetts are classic—and cautionary. An hour spent visiting with a hockey person from Massachusetts and learning about the state’s rich hockey history is an hour well spent. Unfortunately however, many of these conversations end with a sigh and sense of melancholy. Apparently a generation or so ago, youth hockey in Massachusetts became much less of a community fixture and much more of an industry. What once was town teams feeding prep and high schools playing in public rinks became club teams feeding junior teams playing in private rinks. Not surprisingly, far fewer young people are playing hockey in Massachusetts today. The impact has now reached the highest levels. Just 20 years ago Massachusetts had almost twice as many natives in the NHL as Minnesota did. Now Minnesota has almost twice as many natives in the NHL as Massachusetts. The importance of municipally owned ice rinks can’t be overstated. Most call it the State of Hockey. I call it The People’s State of Hockey. Without getting political, hockey in Minnesota is subsidized. Fortunately for those of us who love hockey there are enough taxpayers in St. Louis Park, Marshall and Proctor that view an ice arena in much the same way they view a playground—an asset worthy of community funding. Most importantly, Minnesota has more “lightly skilled” hockey players than anywhere else. Sure, Minnesota has far more NHL players and NCAA players than any other state. Minnesota also has far more hockey players who struggle to crossover both ways. This I know first-hand because I’m a lifetime member of this group. The community and high school structure of hockey in Minnesota is the biggest reason why so many of us play. There is safety in numbers and the more Minnesotans that continue to lace ‘em up, the better. Hockey in Minnesota is far from perfect. There are many opportunities to improve the experience for all involved in our state. But the opportunity lies in making our model better, not different. In Minnesota, the proverbial hockey toothpaste is still in the tube. Let’s make sure it stays there. Mike Snee is a Duluth native and the Executive Director of College Hockey Inc., an organization that provides young hockey players with information about college hockey and how to retain NCAA eligibility. MARSHALL – Southwest Minnesota State University will serve as the proud host of the NCAA Division II Central Region Tournament this Thursday, Friday and Saturday at the PE Gym on the campus of SMSU. The eight-team region tournament will have four quarterfinal matches on Thursday, a pair of semifinal matches on Friday night, with the championship match set for Saturday afternoon. Ticket prices for the tournament are $8 for adult general admission, $5 for student general admission, while children 5-and-under are free. All tickets will be sold at the door. For more information, go to official tournament website at SMSUmustangs.com/NCAAVB. The winner of the tournament will advance to the Division II Elite Eight held on Dec. 7-9 in Pensacola, Florida, on the campus of the University of West Florida. The tournament begins on Thursday at 12 p.m. with No. 2 seed Concordia-St. Paul facing No. 7 seed Central Oklahoma. At 2:30 p.m., No. 3 seed Nebraska-Kearney will battle No. 6 seed Missouri Western. The 5 p.m. match as No. 4 seed Northern State taking on No. 5 Minnesota Duluth, while the quarterfinals conclude at 7:30 p.m. with No. 1 seed Southwest Minnesota State facing No. 8 seed Arkansas Tech. Southwest Minnesota State (28-3), ranked No. 2 in the latest AVCA Top 25 poll released on Monday, will be making its 14th straight NCAA tournament appearance and 15th overall in program history. SMSU last hosted the Central Region Tournament in 2010. 12 p.m. – Quarterfinal 1: No. 7 Central Oklahoma (29-5) vs. No. 2 Concordia St. Paul (28-3). 2:30 p.m. – Quarterfinal 2: No. 6 Missouri Western (24-10) vs. No. 3 Nebraska-Kearney (33-3). 5 p.m. – Quarterfinal 3: No. 5 Minnesota Duluth (24-6) vs. No. 4 Northern State (23-6). 7:30 p.m. – Quarterfinal 4: No. 8 Arkansas Tech (35-0) vs. No. 1 Southwest Minnesota State (28-3). 5 p.m. – Semifinal 1: Q1 winner vs. Q2 winner. 7:30 p.m. – Semifinal 2: Q3 winner vs. Q4 winner. 3 p.m. – Semifinal 1 winner vs. Semifinal 2 winner. Youth tournaments have become as much a part of the fabric of a Minnesota hockey season as anything else. Each year, just about every youth association statewide hosts tournaments at various levels. The tournaments are a chance for teams to compete against other associations outside of their district, travel to other parts of the state, and stay overnight with their teammates and families where they can enjoy activities outside of the arena. Many associations utilize tournaments as a valuable fundraiser to help them fund their programs, which is why tournaments have become a competitive industry in the Minnesota Hockey landscape. That is something the city of Marshall (pop. 13,664) took into consideration when they built their new state-of-the-art hockey facility in the prairie town located in southwest Minnesota. The Red Baron Arena and Expo has two sheets of ice and all the amenities needed to put on a first-rate, five-star tournament. One of the amenities at the new Marshall arena include live streams of every game. Rahm says there is something about players at the youth level being able to watch themselves on a camera not operated by mom and dad, as well as relatives and friends being able to catch the games from wherever they are if they have a computer with internet access. And it’s not just one camera bringing in all the action. Marshall uses three manned cameras during games and seven robo-cams, including goal cams above each net. Then there is the 14-by-25-foot video screen that has the ability to show period highlights and replays. The large scoreboard was thanks to a large investment from the city of Marshall. The video board and all its electrical components brought a price tag of $750,000. “That commitment from the city and the taxpayers will keep us separated for a long time,” said Rahm. The Red Baron Arena was voted the best arena in the state by WCCO Television. Marshall also was host of the Minnesota Hockey Bantam A and AA State Tournaments this past winter. Rahm said the Marshall Hockey Association went “all in” on the tournament experience for the kids, including having a cameraman on the ice for introductions, similar to the boys’ state high school hockey tournament. “Those Bantam players skated out and showed off their hockey hair like they wanted to make all-hockey hair team,” said Rahm. Each team was appointed an official host to help coordinate things such as hotel stays, where to eat and what to do between games. This year, Marshall will host tournaments at every level. They will also host the Bremer Invitational, bringing in communities that are served by Bremer Bank. Rahm said location is also key. Marshall is about three hours from the Twin Cities metro, two hours from central Minnesota and under four hours from Fargo. They also draw teams from Iowa and Nebraska. With a new facility that has all the amenities and a concerted effort to make each tournament experience the best it can be, Marshall has joined a long list of hockey communities throughout the state as a premier Minnesota hockey destination. Red Baron® pizza is a nationally recognized brand that’s made and marketed by subsidiaries of The Schwan Food Company, longtime supporters of sports events and facilities — particularity hockey venues — in Minnesota. Additionally, The Schwan Food Company, which was founded in Marshall in 1952, has been a strong supporter of the local community through charitable giving and youth athletics funding and promotion. The Schwan Food Company donated more than 29 acres of property to the City of Marshall to support the MARSH facilities and infrastructure. The company also sold approximately 14 acres of land to the City of Marshall at a discounted market rate for the development of four softball and youth baseball fields within the Hub. The Red Baron™ Arena & Expo, features two sheets of ice and an exposition center. The facility is the centerpiece of The Schwan Regional Amateur Sports Center and a part of the MARSH, which includes more than three dozen city, school and college sporting facilities in Marshall.